These easy chocolate chip cookies only require 6 ingredients! With only butter, flour, sugar, egg, salt, and chocolate chips you can make great chocolate chip cookies! It just feels like warmth, love, and home. And while I love fancy cookies, sometimes I just want easy chocolate chip cookies. I don’t think there is any secret by now that I have a certain obsession affection for cookies. Especially the kind mentioned above. Sold. That’s all it took. Bribery via warm chocolate chip cookies and I’m diving into the tub. I think sometimes people who don’t bake very often do not realize that cookies can really be a simple thing to make. 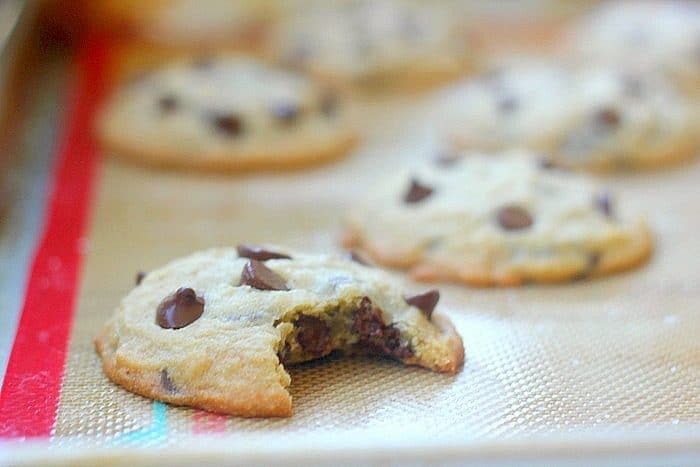 You really only need 5 ingredients to make fantastic easy chocolate chip cookies and I bet most of us already have them in our pantry! I created this simple chocolate chip cookie recipe that comes together quickly and uses things that you probably only have in your pantry! NOTE: If you are wanting an easy vegan recipe, check out my post specifically for Easy Vegan Chocolate Chip Cookies. The fat in the butter is important for creating tenderness and flavor. The moisture from the butter is also necessary to hold the cookie together and to create some tenderness when it heats in the oven and steam is released. This recipe is created for the use of regular butter, salted or unsalted. You can substitute margarine or vegan butter, but results will vary. Sugar is for the purposes of sweetness as well as structure in the cookie. Brown sugar gives the cookies chew and moisture. Granulated sugar will not work for this recipe. You must use light or dark brown sugar for these cookies. A large egg is preferable. This recipe has been made successfully with other vegan egg substitutions (such as Ener-G egg replacer) however, results will vary. Baking is science! When you alter recipes the results will also be altered. Check out my recipe for 6 ingredient vegan chocolate chip cookies if you are looking to veganize these! All-purpose, self-rising, or bread flour. All of them work! Because this recipe does not add any leaveners you can use self-rising flour in this recipe. To measure flour, lightly spoon it into measuring cups (do not pack down!) and level the cup off with a knife. If you used salted butter or self-rising flour, then the dough will already have salt in it. However, if you used unsalted butter and all-purpose flour or bread flour then you definitely need to add a bit of salt. While technically the cookies will bake perfectly fine without the salt, the flavor will be completely flat and just taste overly sweet without the addition of a little salt. That’s it! 6 ingredients: Butter, sugar, egg, flour, chocolate, salt. You don’t need baking powder and baking soda to make very simple cookies. Sure, if you have the time and want to make a more complicated recipe, then go for it! But this is that recipe for a quick, throw it together, I need cookies in my mouth in less than 15 minutes, kind of recipe. Easy chocolate chip cookies win! Go make them. It is time. Note: The point of this recipe is that it is very stripped down and simplified. They are simple and perfect in that way. If you have the time and want to try more over the top cookies, check out this post for my Best Chocolate Chip Cookies. Add the egg and vanilla (if using) to the butter/sugar mixture and mix until incorporated. Stir in the flour (make sure your flour has not been packed down into the measuring cup when measured or there will be too much flour in your cookies), salt, and the chocolate chips just until combined. Do not mix for a long time after adding the flour, it will create cookies that are too tough or cakey. Scoop into mounds about 2 TBSP each onto ungreased cookie sheets (you can use a silpat or parchment paper to line your sheets). Do not put more than 9 cookies per sheet. 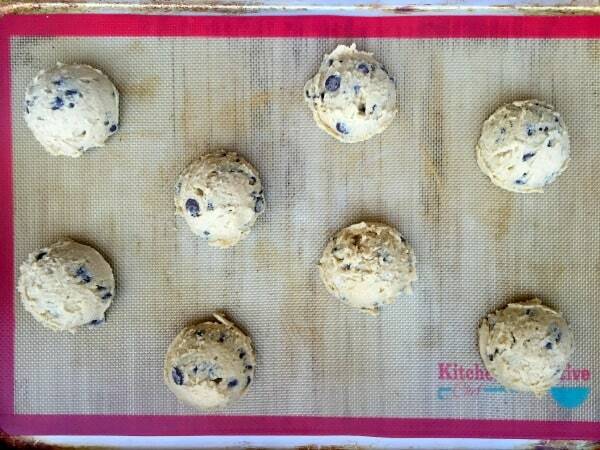 Allow to cool on the baking sheets for 5 minutes before removing. Cookies will continue to cook on the sheets for a few minutes. I put in baking powder& sofa also half bar baking chocolate i also used light & dark brown sugar. Vanilla & almond extract. Best cookies i ever made. This is my new go-to chocolate chip cookie recipe! So easy, flexible, and delicious. I usually add all the add-ins as I have them in my pantry. I also add 1 t of cornstarch for softness. I love these! So simple and easy. My boyfriend asks to overload them with chocolate chips. I don’t mind that (^_^) Fun to throw anything in there. Peanuts, pecans, M & Ms. Even baked the dough into 6 small bowl shapes (no chips added) and poured in an cinnamon apple saute. Really a multi purpose dough. These are the best chocolate cookies I’ve ever had!! I used all of the ingredients. So soft and delicious. My family requests that we always have a batch ready to eat. Lol. To make more at a time, can I just double the ingredients? Love how easy this recipe is and the results for me were awesome. Great time saver for making cookies that will be eaten quickly by my two 4 year olds (twins) and my husband. I just added the baking soda optional ingredient and spooned them out by 1 tbsp . I had to adjust my baking time as well to 13 minutes because of my gas stove. They turned out chewy and perfect, lightly brown. Thank you for posting this! So glad you and your family loved these! That is exactly what this recipe is for! My daughter was craving some chocolate. We had a good time making them at 10 pm. On the recipe. They were not sweet to me. Sorry to hear these didn’t work out for you! Sounds like you may have measured your flour incorrectly, resulting in too much flour in your dough. This is a common baking mistake. You want to fluff up your flour and lightly spoon it into you measuring cup and level off the cup. Do not pack the flour down into the cup. 1 & 1/4 cup of flour measured this way is the perfect amount for this recipe and the cookies will be sweet! Hope this helps! Made these today in a sweet tooth pinch. They were disappointing and didn’t come out like the video or picture suggests they would. They came out like a cross between a biscuit and shortbread cookie. Tasted ok but nothing like a chocolate chip cookie should. I wouldn’t make it again. Sorry to hear this recipe didn’t work out for you. Thank you for the feedback. This is a tested recipe with many many successes so I want to help you figure out what may have gone wrong here! The way you describe the texture of the cookie, it really sounds like you had too much flour in your batter. This is a common baking mistake. You want to fluff up your flour and very lightly spoon it into your measuring cups and level it off without packing any of the flour down. You also want to be careful not to mix too much as this can cause your cookies to be too dry as well. Hello! I just made these cookies and they turned out wonderful! I followed the recipe. I live in high altitude place so I added the optional extras ( baking soda, powder) I baked 2 separate batches the first one I baked it for 1 minute too long so the second one was perfect only 10 minutes. Thank you so much! Now I will only make these cookies!!! In order to make it slightly healthier, would it be okay to substitute the brown sugar with Coconut Sugar? Coconut Sugar is more powdery than brown sugar, so do you think it would work? In your opinion, how should I alter the recipe for this change of sugar? These cookies we’re not very good. Took way to long to cook, and we didn’t have chocolate chips. They didn’t fully cook through and the batter was VERY wet. BEST CHOCOLATE CHIP COOKIE RECIPE OUT THERE!!!! basic, simple, quick, and exquisite. I never “post,” don’t care to take the time to, but waaaaaoooow! thank you so much for your recipe, Baker Bettie!!! Very soft cookies!!! I added the baking powder, baking soda and vanilla. They came out perfect!! Will make these again!!! Thanks! This is the third time I’ve made these, and they’re always great. I used margarine, 1 1/2 tbs baking powder, and 1tbs baking soda. It was the best batch so far. Mine spread a lot, although I followed the recipe. I’m thinking it may be because I live in a very humid climate. Would there be anything I need to change for humidity? Thank you so much for this recipie . Saved my face when the brownies i made turned out be a utter failure . The cookies are absolutely yummy . I added blue food colouring too turned out great . Keep up the great work ! Hello. I was wondering if it would work if I used all purpose flour? Getting the ingredients ready and realized I don’t have self rising. Hi there. This recipe calls for all purpose flour. Self-rising will also work for this particular recipe, but it was written specifically for all-purpose flour. Just whipped these up, used bread flour and took advice to ad baking powder, soda, vanilla and salt. Still a super simple and easy recipe and turned out ahhhhhhmazing! Yes they spread while baking, that made them even more pleasant. Big gooey yet crispy edge cookies, perfection!! I only used he salt and baking sofa and they tuned out perfect! I am currently trying a new twist by adding a tablespoon of peanut butter and used peanut butter cup instead of the chocolate chips. I made these tonight, used self rising flour 1 cup & they turned out great!! I only had dark chocolate, but it made it even better!! I will be making these again & again. I made these (almost) exactly how you said, except I substituted the egg for a tablespoon of ground flax and 3T water. I did use the cup of chocolate chips like it called for, but I had mini choc. chips and it seemed that the cookie was dare I say too chocolatey* haha. But it was good other than that part! Thank you!! It’s so interesting that I always feel that way when I use mini chips in cookie recipes! I think maybe because the chocolate is more dispersed throughout. I always decrease the amount when using mini chips! Thank you so much!! Turned out great. But they did not turn out like the picture at all. Hello Great Receipe….Dad here–in a pinch to make cookies for the children–what a hit…Big high five for Dad………….!!! So awesome! Dad for the win! Amazing. Was looking for something sweet and was happy to have all the ingredients. So glad to hear it Julie! Have a wonderful Thanksgiving! Soooo good. Used special dark cocoa powder in place of 1/4 cup of the flour AND dark chocolate chips. So rich! Can I use normal flour instead? Fabulous. Everyone enjoyed them. Always asking for these cookies. Dad’s Cookies………. Great for baking with kids i would scale back on the butter slightly just for my taste but moreover great recipe! Love, Love this recipe! So easy and so yummy! I bake them every year at my annual Christmas Cookie Bake exchange and they are a hit every year! They didn’t spread at all and tasted too strongly of butter. The weirdest thing is that the chocolate chips, which usually melt in other cookie recipes I use, stayed mostly solid. What four did you use all purpose or cake flour?? Mine turned out great! I did include salt, baking powder, vanilla, and baking soda since I had all that on hand. Only subs I made were, I used gluten free flour and Andes creme de menth baking chips instead, since that’s what I had and we are snowed in. They turned out AMAZING! They clearly said don’t add white sugar. Why rate the cookie low when you did not follow the directions?? I love these cookies. Simple and minimal ingredients. I didn’t change anything, unusual for me. I always change recipes to suit my style. I used imitation vanilla chips because my son doesn’t eat nuts. Next time I will add some chopped cashews to them. Perfect taste and texture even to my picky teenager. I was bored and wanted to make cookies, after searching for awhile, I stumbled across this recipe. I love this recipe. I added a dab of cream cheese and 1/2 cup of pecans, they came out great. I have never been able to make cookies the correct way until now. Thank you for this recipe. This recipe was a life saver tonight! I needed a recipe that only used one egg because that’s all I had left. I babysat my little nieces. We had a ball making these chocolate chip cookies together and ate them while we made some crafts. I added vanilla and baking soda and they came out delicious!!! Thanks for posting this recipe. Amazing! Added vanilla a friend made but followed the recipe as stated. Gooey and so tasty. Thank you! These cookies were great!! !..did just the 5 ingredients and it was perfect. I felt like a real baker…:-) Kids and hubby loved them!! Thanks for sharing, looking forward to bake again. I just made your recipe (with salt, baking powder and baking soda), it looks like your picture and taste soooo good. I rolled the cookie in balls and flattened with my hand, spread a little. Half the dough I added yellow raisins and some pecans, which are in the oven now. The first batch I froze and no problem, in case your readers want to know. Just made these and they turned put perfect!! Followed directions exact. Gone in 5 minutes! Loved by all my friends this delicious cookie recipe. For my gluten free friends I used Pamela’s pancake and bake flour, with nuts and raisins came out just perfect. They requested I make them again this week. Looking forward to trying your other recipes, glad I found you. These are really goodmy kids love them. Simple and Delicious! I’m a happy camper. Thank you!